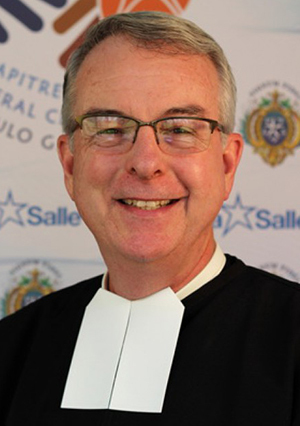 Brother Timothy Coldwell, FSC, was elected today, May 22, as General Councilor with specific responsibility for the Lasallian Region of North America (RELAN). Prior to being elected General Councilor, Brother Timothy served as Visitor of the District of New Orleans – Santa Fe for seven years. In 2014, Brother Timothy marks his 43rd year of association with the Lasallian mission, beginning with his days as a student at Archbishop Rummel High School in Metairie, LA. The native of Denver, CO, entered the novitiate in 1979 in Ontario, Canada, and made his final vows in 1986. His prior assignments and duties have included service as teacher, dorm prefect, soccer coach, and administrator at San Miguel High School in Tucson, AZ; St. Paul’s School in Covington, LA; Notre Dame High School in Shreveport, LA; and St. Alphonsus in New Orleans, LA. In addition to serving on the Regional Conference of Christian Brothers (RCCB), Brother Timothy’s other Lasallian leadership experiences and contributions over the years have included participating in numerous Regional and international Lasallian programs, serving in District ministry as Vocation Director, and serving in Institute ministry as Secretary for Formation. Brother Timothy succeeds Brother Robert Schieler, FSC, who was elected Superior General earlier this week. In a change from the former structure, the delegates decided earlier in the week to reduce the number of General Councilors from eight to five. Previously, three of the eight General Councilors resided at the Generalate. The five General Councilors elected in this Chapter each have responsibility for a particular Region.